Hillary Rodham Clinton called for a vote Friday in the Democratic-controlled Congress on a summertime suspension of the federal gasoline tax, a plan that Barack Obama dismissed as a political stunt that would cost thousands of construction jobs. "It's a Shell game. Literally," Obama said to laughter from his campaign audience, adding it would mean little for hard-pressed consumers. The Democratic presidential rivals highlighted their differences in ads and speeches across North Carolina and Indiana, two states with primaries Tuesday. Polls point toward a particularly close finish in Indiana, which is next door to Obama's home state of Illinois. Surveys show him with a dwindling advantage in North Carolina, and Clinton decided to spend all of Friday and Saturday in the state before returning to Indiana for a final push. The two primaries have 187 national convention delegates at stake. Obama, the front-runner, leads in the overall delegate competition, 1,736.05-1602.5. Clinton won a decisive victory last week in Pennsylvania and is counting on a strong run through the late primaries to persuade convention superdelegates to help her overtake her rival. Jolted by Thursday's defection of Joe Andrew, a former national party chairman, Clinton responded with a letter from seven other former party heads and the family of an eighth. "Her base of support includes women, Hispanics, seniors, Catholics, middle and low-income Americans, and rural, suburban and urban voters. That's a formidable coalition tailor-made for victory in a November general election," they wrote. They added that if the election were held today, Clinton would defeat Republican Sen. John McCain and win the White House. "Obama would lose to the presumptive GOP nominee," they wrote. Polls are equivocal on that point. Moreover, they have been particularly volatile in recent weeks as campaign criticism takes its toll on the two Democrats and Obama grapples with controversy stemming from the rhetoric of his former pastor, the Rev. Jeremiah Wright. Despite a fierce, occasionally personal campaign, to a surprising degree the former first lady and Obama have generally agreed on most policy issues. That made the proposed suspension in the gasoline tax an exception. And while there is little support among the Democratic congressional leadership for the plan, it was a disagreement that both presidential contenders appeared content to perpetuate. "All I hear about is gas prices. Gas and diesel, everywhere," Clinton said in Kinston, N.C. "Some people say we don't need to get a gas tax holiday at all, it's a gimmick ... I want the Congress to stand up and vote. Are they for the oil companies, or are they for you?" Later, in Hendersonville, she added, "I know where I stand and I know where my opponents stand. ... Senator Obama doesn't want us to take down the gas tax this summer and Senator McCain wants us to, but he doesn't want to pay for it." Clinton has proposed making up the lost revenue by imposing a windfall profits tax on oil companies. Obama's rhetoric grew sharper, as well. "She even borrowed one of Bush's favorite phrases," he said dismissively of the New York senator. "She said every member of Congress should have to tell us whether they are with us or against us." He said the average consumer would save a "quarter and a nickel" a day, and only $28 in three months. McCain also favors the gasoline tax holiday, and Obama said sarcastically that showed Clinton "has his vote," and that the two are reading from the same political playbook. McCain told a town-hall audience in Denver: "I want to give the American consumer a little bit of relief just for the summer. Maybe they'll be able to buy an additional textbook for their children when they go back to school this fall." 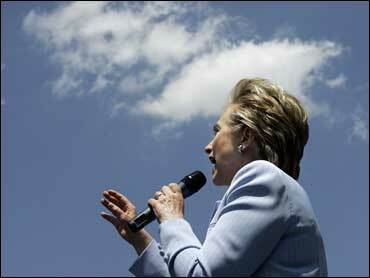 Clinton launched a television ad several days ago critical of Obama on the issue. "The economy's in trouble. When the housing crisis broke, Hillary Clinton called for action: a freeze on foreclosures. Barack Obama said, no. Now, gas prices are skyrocketing, and she's ready to act again. ... Barack Obama says no, again." Obama's aides said they were responding with a new ad for the campaign's final days. Within the congressional leadership, Clinton's position has found relatively little support, and no votes are currently anticipated in either the House or Senate. "First of all, there is no reason to believe that any moratorium on the gas tax will be passed on to the consumer," House Speaker Nancy Pelosi, D-Calif., told reporters on Thursday. "... This has not been the history of a lower gas tax being passed on to the consumer. Second of all, it would defeat everything that we have been trying to do to lower the cost of oil." In the Senate, Majority Leader Harry Reid, D-Nev., said recently that rank-and-file Democrats are divided on the issue. A spokesman said during the day there will be no gasoline tax holiday in legislation Democrats intend to unveil next week. The dispute centered on a pair of taxes, 18.4 cents per gallon of gasoline and 24.4 cents on a gallon of diesel. The money raised goes into a fund that pays for construction of highways and bridges. In Indiana, Obama said a summertime gasoline tax holiday would cost 6,000 construction jobs. The campaign circulated material showing the estimate came from the American Road and Transportation Builders Association, a trade group. The group said the impact on North Carolina would be 7,000 jobs lost.